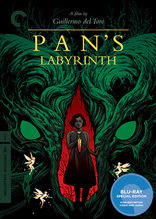 Home / Blu-ray / Criterion Announces the addition of Pan's Labyrinth to the Collection this October!!!! Criterion Announces the addition of Pan's Labyrinth to the Collection this October!!!! The Criterion Collection has announced that they will be bringing us Pan's Labyrinth to blu-ray on October 11th. The film has been available on blu-ray since 2007 from Warner Bros. and New Line Cinema. This is a film that is very worthy of the Criterion treatment. They did an outstanding job with Cronos and The Devil's Backbone, both of which are also Guillermo Del Toro films. I know that this will be added to my collection day one.